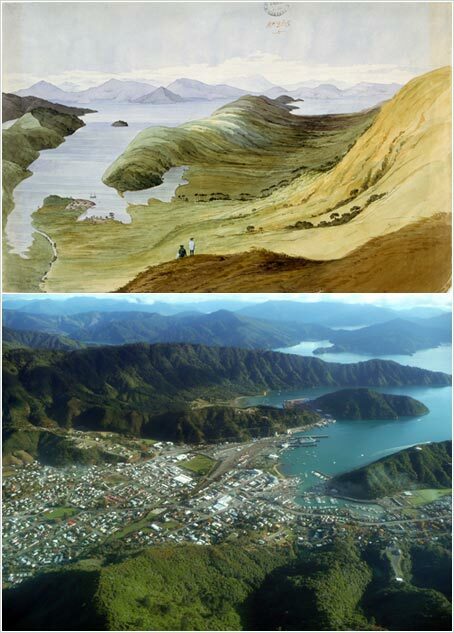 New Zealand Company official (and later premier) William Fox painted the watercolour of Waitohi, now Picton, in 1848 (top image). In Fox’s picture the two main arms of Picton Harbour (the harbour itself and Shakespeare Bay) are in the left foreground, and the Te Āti Awa settlement of Waitohi is at the head of the harbour (bottom left). The bottom picture, taken from the air in 2010, is oriented north rather than north-west, and the shoreline is much changed, but it is not difficult to make connections with the earlier image. Rail yards occupy what was one arm of Picton Harbour. A marina and domain occupy the other arm, and the town of Picton fills what was once open country.